Well we made it through another day of STEM Camp…except we all got a little soaked along the way today. The students were great sports about it! We’re thankful the storms held off and it was just rain today. Unfortunately it looks a little iffy tomorrow still, but we will forge ahead with our STEM fun! Today in the red and blue groups, they did some mathematical modeling with origami and 3D pens with Dr. Jong. The students really enjoyed the challenge of the origami and many practiced lots of patience with the paper folding. It was fun to learn about how to fold the paper in different ways and to put the nets together to form the 3d shapes. 3d pens are always a big hit every year. Not only do they help students build their own models, they also tap into their creative side. They take a lot of pride and ownership in their creations! We love seeing the uniqueness of the students come out! In the green and yellow groups, they visit Dr. Escobar and her graduate students in Chemical Engineering. They conducted some investigations with different types of absorbency materials. Then they got to make their own bouncy balls and chapstick! I’m sure they were eager to show you their creations tonight. In robotics, both groups started the First Lego League Challenge today. They were eager to start the different challenges and string all the knowledge they learned the previous 3 days. There were lots of successes and high fives today! How to make oragamis, cube, and shapes. I learned that there is powder in dipers and that it reacts to water. Everything! It was all awesome! What shapes did you use to put together your big origami shape? How did you know how to fit the pieces together? What did you create with your 3d pen? What robot challenge did you start with today? What made you feel successful? What happened when the diaper powder mixed with water? How did you make the bouncy ball? What did you have to combine to make the chapstick? If you wanted to make the chapstick more firm, what would you add more of? We had another fabulous day at STEM Camp! The sea of green looked awesome walking across campus, especially since freshmen registration and orientation started today all across campus! The red and blue groups had a fabulous day with Dr. Walcott in the College of Engineering. They learned about the different types of engineering (Dr. Walcott likes to call them flavors) and toured several of the research labs where the graduate students showed them the latest research they were working on with the professors. They also made robots today called Scribble Bots…the students had a blast building their robots and learning about circuits. They may need some hope taking the battery in and out as the case is really tight for it. The yellow and green groups took a turn in Dr. Cooper’s lab today with him and his graduate students! Many came home with tracings of their body – they traced themselves and then drew pathways of the nervous system. They then did some investigations with sensitivity, the nervous system, and crawfish. They also visited the medical education center where they looked at different human organs, some were diseased and some were healthy. The students were surprised at how heavy the brain was! 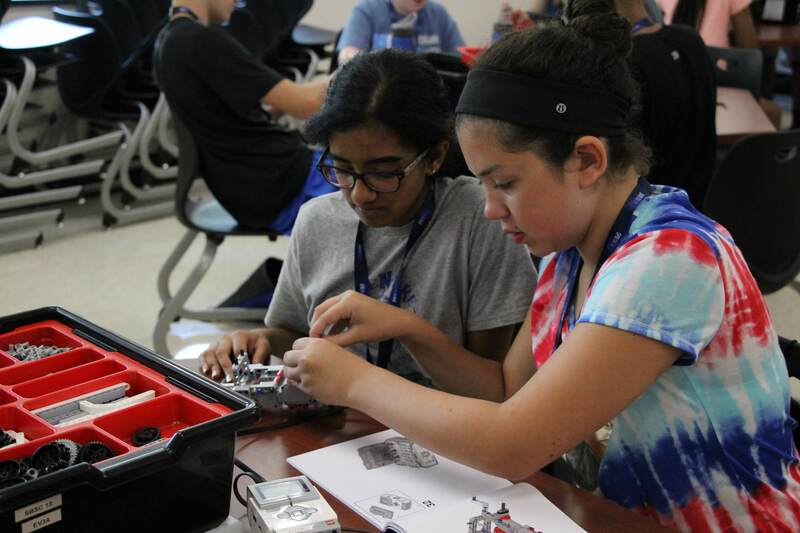 In robotics, all groups dove right into programming today. They learned about the FLL challenge they’ll be doing on Thursday and goals for programming this week. They started on the maze challenge and color sensor challenge. Tomorrow they will start stringing more code together and adding on different sensors. By making a lobsided moter it creates more vibration. I didn’t know that the signals from the brain react to your body when you get hurt. What was your favorite part of the engineering tour? What did you learn about engineers today that you did not know before? Tell me about how you assembled your scribble bot. How did you know how to connect things? What did your scribble bot do when you connected the motor to the battery? What does the glue stick on the end of the motor do? What did you want your robot to do today? How did you get your robot to do what you wanted it to do? How do muscles in your arm move? What is the path of the signals? How do you create electricity with your arm? What was the most interesting thing you learned about the human organs today? Wickedly Hot Kick Off to Week 3! We had an awesome Day 1 of our 3rd week of Camp this month! It was a pretty hot day, but the 120 students were very diligent about drinking water throughout the day. Check in went really well today…Thanks so much for everyone’s assistance and patience this morning as we got all campers checked in! Just a note about the consent and assent forms that we ask for every year. Our camp is subsidized by an NSF grant that requires research and reporting to the agency. 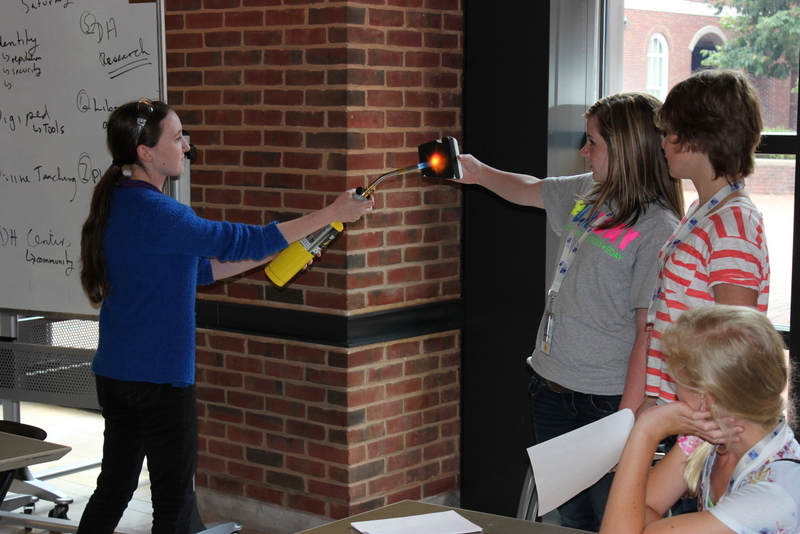 The purpose of the research is to develop a camp model that promotes STEM careers to students and can be replicated. We also look at students attitudes towards STEM and the impact of our activities. Without this grant and consent and assent to participate the camp simply would not exist. We never report any names or any individual data…it’s always aggregated together! You can read about some of our work here. We have a goal to post a blog post each night this week with some highlights from the day and some conversation starters. [Admittedly, our family obligations have been great this summer, so bear with us please 🙂 ] The conversation starters are meant to help you get over the “What did you learn today?” “Nothin’” or <shrugging the shoulders> we often see with our school-age students. We’ll also post a link to the photos we are taking throughout the week. If at any time you want a photo removed that is of your child, please let us know and we’ll be happy to take it down. Please make sure and check twitter throughout the day this week – https://twitter.com/SeeBlueSTEMCamp – we’ll post more pictures and updates throughout the day the rest of the week. 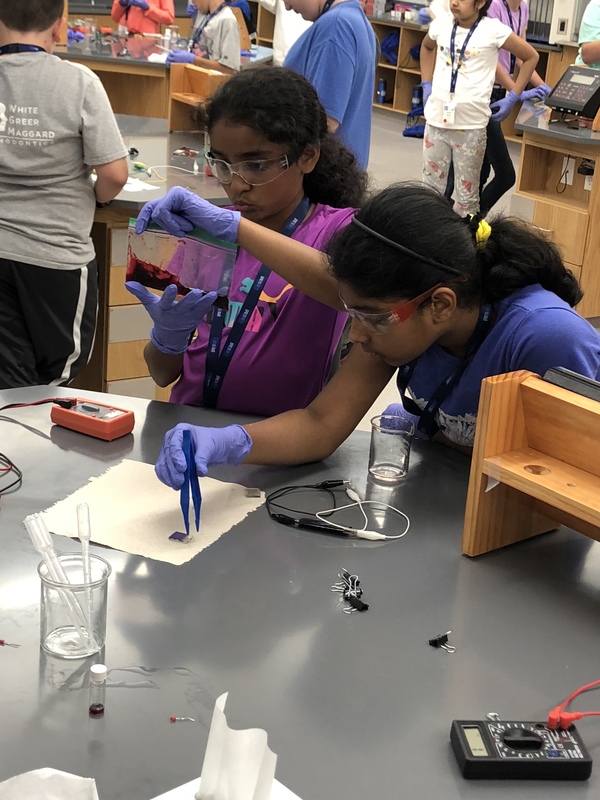 Today in the red and blue groups, they ventured all the way across campus to discover things about their nervous system, look at the human organs in the medical science education center, and conduct some investigations around introreceptors, contracting muscles and other fun stuff! Many of them brought home body tracings they did and some of the major nerve pathways drawn. Be sure to ask about the crawfish investigations tonight! They got to see nerve impulses in action. The yellow and green groups were busy today with Dr. Thomas and making flying objects. They used the engineering design process and lots of mathematics (surface area) and physics to create a flying object out of different types of materials and did some challenges around how far they could get it to fly. They brought home some of the creative flying inventions today. In robotics today for all groups, it was building day. All the students are doing EV3 robots this year. Today they focused on building their robots and learning about how the different parts and pieces work together. Some of the groups flew through building and were able to start on some programming. Tomorrow they will all dive into the programming and start some of our challenges. For the challenges, we use a blend of our own curriculum our robotics instructors have created and some of the FLL challenges, including the new one for this year. I did not know about newrons, axons, bulbs, dendriles, and synapes. I did not know the brain is heavy. I learned about aerodynamics and gravity. more weight in the front of the plane will make it glide more. I learned how exactly planes fly and how weight distribution affects their flight. I learned how flaps on the plane affect how air molecules hit the plane. We know your child is getting to the age where it might be like pulling teeth to get them to talk about their day beyond “It was fine.” “It was fun.” “I didn’t do anything.” So, each day we’ll post some suggested conversation starters centered on camp activities or STEM-related themes. Tell me about how you assembled your robot. What is your robot’s name? What do you think you will get your robot to do when you start programming it? What makes an airplane go into the air? What are the different types of airplanes you created today? What did you take into consideration when you created your airplane? How did that work for you? What are some other things you tried? Each day we’ll post a camp highlight. Click the picture and it will take you to the weekly photo album. Please note that we try to capture pictures of all the campers, but we cannot guarantee that we will get every single one. We try our very best to though! Also we are STEM teachers and not full time photographers, so our pictures are not perfect and we leave them unedited, so if you love to edit photos…feel free! If there is a photo you wish to have removed, please email me and we’ll take it down! I can’t believe another week of camp has flown by! We really enjoyed the students this week and they really enjoyed being positively engaged in the STEM activities! I saw a lot of weary faces leaving today, so I think we also did a good job of wearing them out this week. The red and blue groups got to do some 3-Dimensional modeling with origami and 3D pens. They were very creative with their 3D pen creations! I hope you enjoyed what they brought back to show you tonight. They also created polyhedra using origami paper folding. They really enjoyed this as they got to investigate how 2 dimensional figures can fit together to create 3 dimensional ones. The yellow and green groups got their turn in the chemistry lab today investigating voltage and solar cells! They were amazed at the variations in voltage and current amongst the three different types of fruit. The lemon batteries were definitely a hit as well. In robotics, they wrapped up the FLL challenge. The students have come so far with their programming! All the groups were able to complete at least one different challenge and there was definitely a feeling of confidence in programming when they left today. 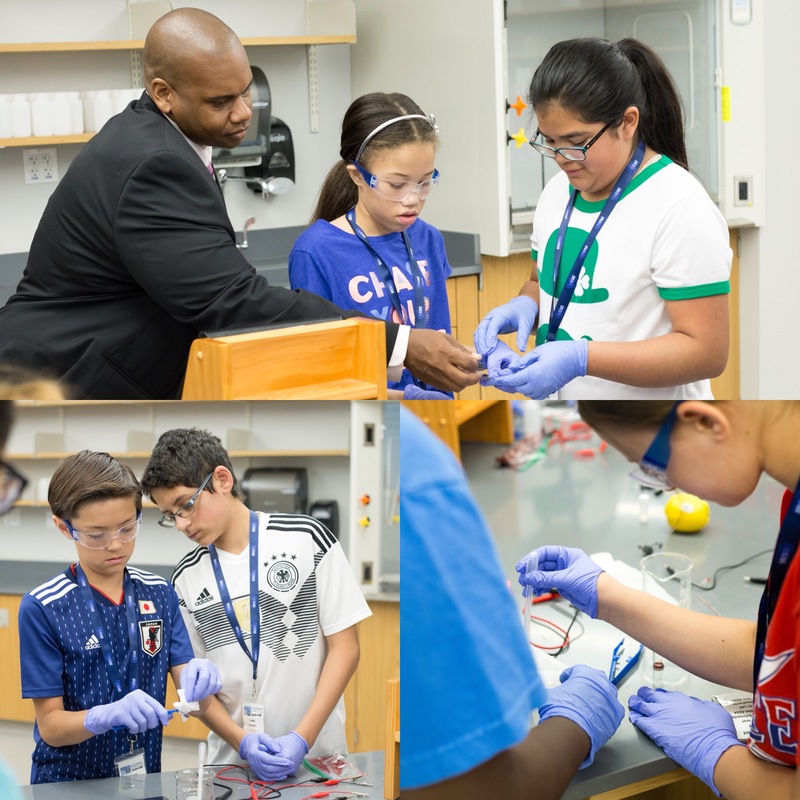 We also had a special visitor today – Interim Commissioner of Education Dr. Wayne Lewis visited camp today. The students were eager to show off their models and talk to him about what they were learning and how it could help them in their classroom learning. We had a great discussion with him about how we could bring more opportunities for engaged STEM learning across the state during the summer and throughout the academic year. I got to actually make a solar cell! I learned about solar cells and how to caculate the voltage of the solar cells. I learned about the Euler’s formula. What challenges did you complete in robotics today? What did you do to get your robot to go? 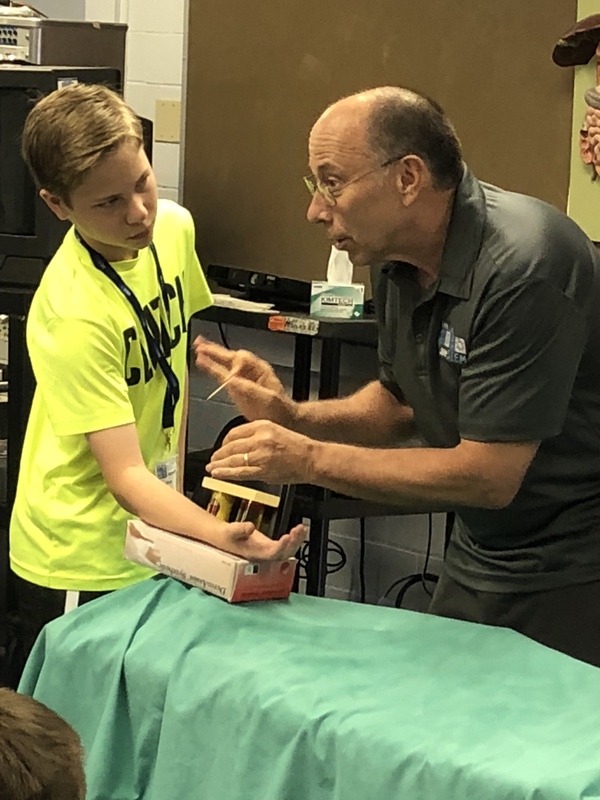 What was the most exciting thing about doing STEM Camp this week? How can you make a battery? What is voltage? How do you make a solar cell? What different kinds of materials did you investigate today around making a solar cell? What happens when you covered up your homemade solar cell? Taking Flight and Solar Energy! Another great day is in the books! The students got a lot of walking today as they were in the beautiful Don & Cathy Jacobs Science Building. 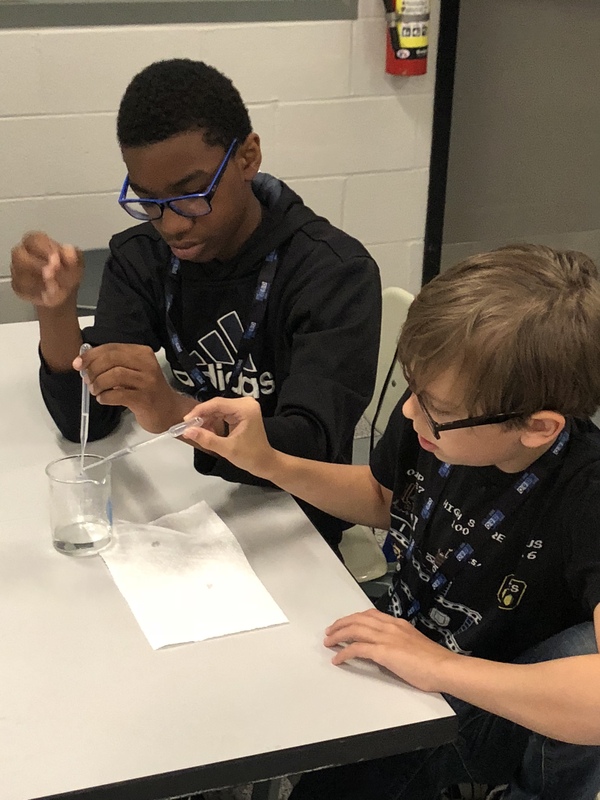 The building is our newest academic building on campus and the science labs in there are always a treat for our students to do their investigations. Today the red and blue groups were with Dr. Graham from the Department of Chemistry. He had them explore solar cells and how different materials used in solar cells compare. They also got to investigate how batteries work and made their own battery! The green and yellow groups took their turn at flight school, looking at the mathematics and physics of airplanes with Dr. Thomas. They made a variety of different types of airplanes to investigate different effects. They had fun flying the planes and making predications about what was going to happen! In robotics, the students started the FLL challenge today. In the FLL challenge, they take their programming knowledge to the next level by adding more sensors, multiple loops, and sequences to complete a challenge task. The students really enjoy the trial and error and of course the end result when their code works! The yellow and green group had a special treat today; they got to meet a local robot celebratory, Marty! This is because I solved a problem by building something with my own mind. – This made me feel innovative. I learned that all 4 dimensions of a plane equal out. I learned that planes need drag, pull, and force to be level in the sky. I learned more about how voltage works. you can use a lemon as a battery. What different types of airplanes did you make? How did they work differently?